By Scott Gilfoid: With WBA heavyweight champion David Haye (25-1, 23 KO’s) finishing up his boxing career at the end of the year and heavyweights like Tomasz Adamek getting up there in age, 2008 Olympic Bronze medalist Deontay Wilder (16-0, 16 KO’s) is poised to move in and make a name for himself as one of the future champions in the heavyweight division in 2012. The 6’7″ Wilder, only 25, has got arguably the best right hand in the entire heavyweight division bar none. Some people think I’m exaggerating here but I’m not. Until you’ve seen Wilder in action landing one of his huge right hands, you don’t know what true heavyweight power is. I’m not the only one that’s seen how special this guy is. 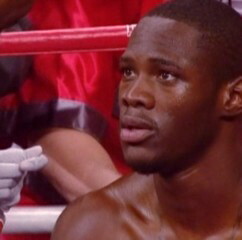 Trainer Naazim Richardson is also really impressed with what he sees of Wilder. Richardson is right. Wilder punches like like a mule. He has incredible power with his right hand and if he can learn to develop his left, he’s going to be nearly invincible. Right now, I already see Wilder beating 90% of all the top heavyweights. The only guys I can see giving Wilder any problems are the Klitschkos, and possibly Chris Arreola, Alexander Povetkin, Samuel Peter and Adamek. I would put Haye in with that bunch but I question whether he would be able to stand up to Wilder’s right hands. To beat Wilder, you have to take a lot of huge right hands and I can’t see Haye taking more than a couple before getting poleaxed by him.